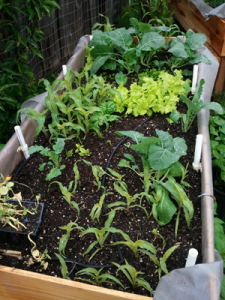 Spring plantings and leafy greens. 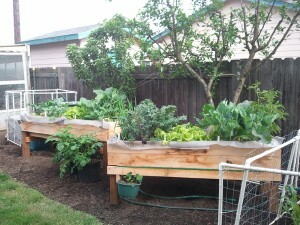 Build yourself a raised planting bed that is great for smaller yards, wheelchair-bound gardeners, and even children! Our Accessible Planter plans will help you build a planter that is 30″ wide and 72″ long. You decide to make it 30″ or 40″ tall. They are inexpensive (2018 cost of materials about $90), easily assembled in about an hour, and will last for years. The detailed plans offered here walk you through the process step-by-step. It’s a truly simple do-it-yourself project that won’t break the bank. 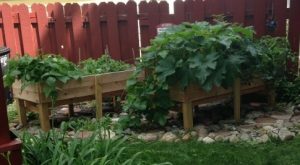 The space beneath the planters is roughly 11″ in clearance (21″ for the taller version), which means you can grow potatoes, vine crops, strawberries, or flowers… whatever your imagination can conceive. Plant in the ground or set pots underneath. When you irrigate the raised planter, some water will drip through and irrigate those below as well. No carpentry skills are needed for this project, although some basic tools are. Our plans walk you through each step, with a comprehensive supplies list and a few options for upgrading materials. Color photos help track your progress. It’s amazing how much you can grow in small spaces. We’ve used our planters for years, and enjoy the ease of access (we don’t have to bend over). It’s almost doubled the productivity of our small yard, since we now grow potatoes and cucumbers underneath the beds of tomatoes, broccoli, and greens. We even grew strawberry plants in pots hung from the sides one year (see picture above). A simple, inexpensive project that can be completed easily in an afternoon, and will last for years.